We’d love your help. Let us know what’s wrong with this preview of Since You've Been Gone by Morgan Matson. Dance It was Sloane who yanked Emily out of her shell and made life 100% interesting. But right before what should have been the most epic summer, Sloane just…disappears. All she leaves behind is a to-do list. To ask other readers questions about Since You've Been Gone, please sign up. Jeri She stole a towel from Frank's neighbors house. Who would this book typically interest? What age, grade, etc. Amicha It's recommended for 12 and up, which is fine, but I'd say it probably interests more of the 14-18ish range, so around 8th-12th grade. Typically, I'd…moreIt's recommended for 12 and up, which is fine, but I'd say it probably interests more of the 14-18ish range, so around 8th-12th grade. In a well-ordered universe.... everybody would read this book. Seriously. It was amazing. If you loved, or even mildly enjoyed Amy and Roger's Epic Detour, pick up this book. YOU WILL NOT REGRET IT. OH MY GOSH THE FEEEEEEELS. This was the first Morgan Matson book I read and it's still just as good. I love the friendship element, I love the facing fears element, I LOVE FRANK. SO FREAKING MUCH. FRANK IS SO BAE SO SO BAE. HOW DOES MORGAN MATSON WRITE THE BEST GUY CHARACTERS EVER. HOW??? Okay I'm done. I just love this book a lot. Seriously the best book I've read in a while! I am completely obsessed with Morgan Matson's writing and how she can make such a cute story without it being sickly sweet or cheesy! This is a story that will stick with me for a while and I definitely want to see it become a movie! *Maybe* I am too old for this book. That is one possible explanation. The other possible explanation is that this book really is just kinda lame. And tame. 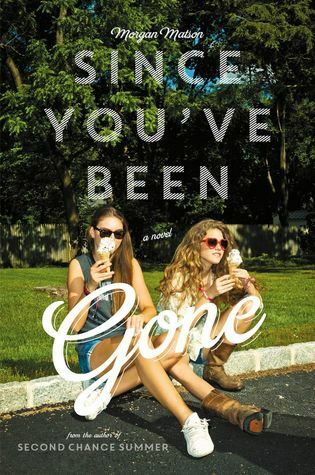 Since You've Been Gone tries to be a cutesy summer story about the friendship between two teenage girls. Which was exactly what I wanted. It also tries to be a tale about a girl learning to take chances, be a little rebellious and try new things. Misspent youth and all that jazz. And I can totally get into the excitement of a good-girl-gone-ba *Maybe* I am too old for this book. That is one possible explanation. The other possible explanation is that this book really is just kinda lame. And tame. 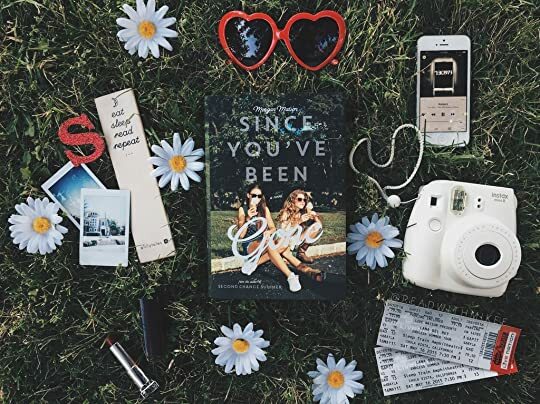 Since You've Been Gone tries to be a cutesy summer story about the friendship between two teenage girls. Which was exactly what I wanted. It also tries to be a tale about a girl learning to take chances, be a little rebellious and try new things. Misspent youth and all that jazz. And I can totally get into the excitement of a good-girl-gone-bad story of naughty youth days and craziness, but the problem is that none of the things Emily actually does are particularly exciting or dangerous or rebellious. This is like the Sunday school version of rebellion. Not that I expected (or wanted) these kids to start shooting drugs in their basements and holding orgies... but apple picking? Yes, apple-picking makes this very random list of adventurous stuff which Sloane sets for Emily to do. The main problem I encountered in this book was a complete lack of any tension, excitement or general reasons to care. This is likely partially due to the tasks set out for our protagonist - of which kissing a boy is like the be-all and end-all of human existence - but it also has something to do with the very dry narrative. I felt zero connection to Emily and zero interest in Sloane. Now, actually standing in front of the water and contemplating swimming in it naked — with my friends — things were no longer seeming quite so simple. Okay, so maybe it's me. But I just don't think swimming naked in some water with your close friends makes you a rebel. Call me a tramp. Maybe it's just because I have the kind of close friends who would (and do) crazy dance around my room in their birthday suits. Or maybe it's because Emily built it up to be such a HUGE thing, edging up to the water with a towel around her, freaking out constantly. Why should I care? You took your clothes off and got in the water - go you! I still don't care. I don't feel the need to give you much more than the description when it comes to the plot - basically, Emily's friend (Sloane) disappears suddenly and stops answering Emily's calls and texts. All Emily has is a list that Sloane left behind, a list of tasks for Emily to complete. Which she does, one by one, hoping they'll lead her to Sloane. It was a quick read that I managed to get through but it was disappointing. The writing and characters felt flat to me and the attempts at rebellion were unexciting. Lastly, I thought the ending was rushed and made the whole thing seem even more pointless. The story felt wrapped up too neatly and nicely, when some of the final reveals warranted a more dramatic handling, in my opinion. Oh well, onto the next. This is the best Morgan Matson book. I’ve long suspected it. Now, I can confirm it. I’ve reread all her works in the last nine months (and I actually trust the opinions of nine-months-ago me, unlike the opinions of two-or-more-years-ago me, who does ridiculous things like think Isla and the Happily Ever After is a good book, which, guess what, it isn’t). This reread bonanza had a lot of bad parts, including, but not limited to: the realization that Matson is not infallible while reading Amy & This is the best Morgan Matson book. This reread bonanza had a lot of bad parts, including, but not limited to: the realization that Matson is not infallible while reading Amy & Roger’s Epic Detour; that realization, again, except with Second Chance Summer instead; the questioning of why her books are so ridiculously long all the time. BUT THEN THIS BOOK CAME ALONG AND WAS SO FLIPPIN’ GOOD. This book has everything. (Please go back in time and read that in a Stefon voice if you didn’t the first time.) Road trips. Heart-shaped sunglasses. Bucket lists. That thing where characters have significant others but only to add a bit more spice to the will-they-won’t-they (even though the answer is clearly of course they will) and yes there’s cheating but actually it’s okay because the unseen girlfriend was also hella done with the relationship. Summertime. Pizza. Fun banter-y groups of friends. Playlists. The classic contemporary plot format in which everything starts out okay but with definite room for improvement and then gets good and then gets PERFECT and then gets so so so so so bad like even worse than the beginning but then turns perfect again and actually perfect-er than when you thought it was perfect because character development. And also romance, of course. It is, in other words, as if someone took all of the best contemporary tropes and wrote them on lil pieces of paper and then tossed them in the air and then they floated down like confetti or snowflakes onto Morgan Matson’s angel head and she wrote this book. I am a sucker for road trips and for bucket lists and for playlists and for snack descriptions and for summer and for banter and ESPECIALLY for when the friendships are more prevalent in a book than the budding romances. And this book nails all of that. It is the most fun thing ever. To give a touch of synopsis: We follow Emily, who has literally one friend. (Sounds like every character in every other book, am I right? It’s funny because most authors are too lazy or romance-focused to build realistic worlds populated with full, human-seeming individuals!) The friend’s name is Sloane, she is fun and adventurous and superhot, and she full-on disappeared a couple days back without telling Emily where she was going. AND NOW SHE’S NOT ANSWERING HER PHONE. AND HER HOUSE IS EMPTY. In her attempts to finish the list (in the hopes it’ll give her some Sloane-related answers), Emily makes friends and has fun and learns it’s not the end of the quest but the friends you make along the way and blah blah blah it’s cute. It’s fun. It’s summery. Bottom line: This is essentially if mad scientists gathered all my favorite clichés and mixed em all together and published them in a 500 page hardcover with a reversible collectible cover. In other words: PERFECT. in a well-ordered universe, morgan matson would just write every contemporary??? she is the only one that seems to recognize that the ideal contemporary is a careful mix of friendship + banter + road trips + bucket lists + summer + snacks and then a liiiiiiiil bit of romance. this book is the sh*t.
morgan matson is a summer queen (yes, i know its still technically winter, and in a well-ordered universe i would have waited to read this, but patience has never been my strength)! this story is light and fun and carefree - everything you want from a fluffy contemporary read. but what really makes the book something is emily. i loved reading about her love and friendship with sloane. a lot of YA contemporaries focus on the whole ‘girl meets boy’ storyline, and although there is a romance in this morgan matson is a summer queen (yes, i know its still technically winter, and in a well-ordered universe i would have waited to read this, but patience has never been my strength)! i loved reading about her love and friendship with sloane. a lot of YA contemporaries focus on the whole ‘girl meets boy’ storyline, and although there is a romance in this story, its not the focus. its the cherry on top. and the delicious sundae is witnessing emily accomplish things that help her grow, even if they are scary. because sometimes its facing the things that scare us the most that help us become the best possible person we can be. and its so rewarding to see how emily discovers that as she tries to stay connected to her best friend. such a refreshing and wholesome story - perfect for any summer TBR! At first i was a bit apprehensive about this book, probably because of its length and the amount of hype its received, but oh my gosh, a book has never lived up more to the hype, and well and truly exceeded my expectations. It was everything I wanted it to be, yet nothing I expected it to be and so much more. This book was unlike any contemporary novel I've read before. It was a perfect blend of all the best aspects that a book can give. The characters were amazing, the plot was one of the best I've ever read, the setting was just so vivid that i found myself completely lost in this book and shutting out everything going on around me, this is how you know you love a book. The whole plot of Emily's journey and her character development was written so exceptionally, the romance was one of the best I've ever read, Seriously, someone find me a Frank Porter. This is definitely a book that's going on my favourites shelf, in-fact one of my favourite books of all time , and will not be forgotten for a realllly long time, it has made a print on my little reading soul, hahaha, It taught me so much about life and about who I should strive to be as a person. It showed me what real relationships should be like, it provided the most beautiful insight into friendship, and all things to do with becoming who you are. This will most definitely not be my last Morgan Matson book, her writing is amazing! Why has it taken me so long to pick up one of her books? All-in-all, this book was incredible and I'd recommend it to anyone and everyone. Please do yourself a favour and read it. this is not the kind of book i would ordinarily read. i tend to stay away from contemporary YA novels, ones where real-seeming teens do real-seeming things. give me grand battles to the death, or a pandemic of some kind, zombies or even just basic wilderness survival, and i am on board. but teens who aren't in peril in some way?? not usually gonna blip my radar. but i read this one at the urging of a work-friend, and i gotta say, i enjoyed it. yeah, it's just an unchallenging summer read, but it this is not the kind of book i would ordinarily read. i tend to stay away from contemporary YA novels, ones where real-seeming teens do real-seeming things. give me grand battles to the death, or a pandemic of some kind, zombies or even just basic wilderness survival, and i am on board. but teens who aren't in peril in some way?? not usually gonna blip my radar. but i read this one at the urging of a work-friend, and i gotta say, i enjoyed it. yeah, it's just an unchallenging summer read, but it's charming as hell. it's an appealing book about girl friendship and loyalty with a dusting of romance and it makes a nice change from the hard-edged teenage girls i've sort of grown accustomed to in my readings. these girls aren't the back-stabby predatory girls of a megan abbott novel, they're good, wholesome girls who care about each other with a refreshing lack of all the competitiveness and jealousy that infects so many female relationships in YA novels, and it's a sweet little lollipop of a read. emily and sloane are the always-together kind of best friends. sloane is dynamic and charismatic, while emily is a little more reserved, shy, and content to hide out in sloane's dramatic shadow. but sloane's not looking for a sidekick, and she frequently encourages emily to break out of her shell, making little to-do lists in the shape of dares for emily on the occasions when she has to go away on vacation with her parents, and encouraging her to take spontaneous risks and stop being afraid. emily appreciates these efforts, but she will generally only fulfill a portion of sloane's lists, avoiding the items she doesn't feel comfortable attempting. but one day, sloane vanishes without a trace, at the beginning of what was meant to be their most epic summer ever, which had already been mapped out in detailed plans and adventures. sloane doesn't answer her phone, her house is empty, and emily has no idea what could have happened to her, until she receives an envelope from sloane in the mail, with a new thirteen-point list for emily. bewildered, emily decides to meet every challenge on the list for once, hoping it will somehow lead her back to sloane and provide an answer to her sudden disappearance. however, this list seems to be more pointed than its predecessors, and calls out some of emily's most ingrained fears and reservations as it encourages her to: ride a horse, kiss a stranger, and skinny dip, none of which emily would ordinarily even consider doing. but if it will bring her closer to an answer, she will do whatever it takes. what follows is a summer of growth and change for emily, as she branches out under sloane's indirect influence, tries new things, makes new friends and with her parents conveniently distracted all summer long, finally gets her answers. this is a book in which there are no "heavy" problems. no one gets bullied or sexually assaulted, and it is all very lightweight suburban teenage drama, so it is perfectly safe to give to younger or more watched-over teens. i was hoping for a little twist - part of me wanted this fairytale-like set of challenges to culminate in a lesbian angle where emily found her way back to her princess sloane, but nope. i will say that despite my (mild) sapphic-disappointment, the conclusion is reasonable and satisfying, and it really was a pleasure to see emily's transition into something that wasn't emily-before-sloane or emily-with-sloane, but something all her own, realistically confident and less constrained by her own fears. there is one scene in particular that i thought especially deft and subtly-written, which illustrates both her inner and outer changes. …I texted back without a second thought that I'd be there soon. I reached for a Sloane-chosen outfit - a vintage dress from Twice that I'd worn a lot last summer. But after I put it on, I found myself pulling at the straps, tugging at the hem, not liking what I saw in the mirror. For some reason, it didn't feel like me any longer. I took it off and changed into the denim skirt I'd bought with Dawn last week and a white eyelet tank top. Feeling more like myself, somehow, I dabbed some makeup on, and made sure to get Frank's present before grabbing my flip-flops and heading back to the car. before this, it would have taken her paragraphs to decide whether or not to go to the place she is going, and she would have dressed herself as an accessory to sloane, but in this scene towards the end of her summer, she is finally all herself, and very comfortable in her own skin. looks like emily isn't the only one who has grown this summer - i learned that it is possible for me to appreciate books even when teens aren't getting slaughtered by zombies or bears. and that's progress! This book was really, really enjoyable! The first 100 pages I was hooked and I loved it, but the book started to lose its luster from then on out. I thought this book was the perfect summer read and it put me in a great, summery mood. I thought the story was interesting and I was definitely unable to put this book down, hence why i'm writing this review at 3:30 in the morning and I have a job interview in less than 7 hours. But really quickly I began to notice that Emily was a bit of a coward. S This book was really, really enjoyable! The first 100 pages I was hooked and I loved it, but the book started to lose its luster from then on out. I thought this book was the perfect summer read and it put me in a great, summery mood. I thought the story was interesting and I was definitely unable to put this book down, hence why i'm writing this review at 3:30 in the morning and I have a job interview in less than 7 hours. But really quickly I began to notice that Emily was a bit of a coward. She was overwhelmingly shy, to the point where she chickened out to do most items on her list the first time, and she was terrified of confrontation. This was a bit frustrating to read. I found that the overall plot of this book was just predictable. There was no twist that really surprised me, everything kinda fell into place, etc. This really does take on a very cliche moral of "omg im so shy and introverted but oh gee im gonna do this list so that i can break out of my shell and oh gee at the end of this, i'm magically more confident!" This is the main reason I took off a star, just because it was nothing new to me. Lastly, I just kind of had a problem with Sloane's disappearance. First of all, the reason the book says that she disappeared was totally weird and I feel like Emily would have known about it, like there's no way she could have been taken by surprise that her friend was going. Other than the weird premises of Sloane disappearing, I realized as I was reading flashback scenes of Sloane and Emily's friendship that Sloane really wasn't that great of a friend. I was wondering why Emily cared so much about a girl that treated her so poorly. This book was so fun and cute. I rarely read young adult contemporaries because I feel like I've outgrown that stage of my life, but Since You've Been Gone gave me all the giddy school girl feels that I've missed from way back when while I was in high school. I just loved the whole concept of the list and the friendship that Sloane and Emily had. It actually reminded me a lot of me and my best friend and how opposite we really were. We're about as opposite as people could ever get but we somehow make the best of friends. Sloane and Emily's friendship was nowhere near perfect and sometimes it wasn't pleasant at all, but it was real. Morgan Matson was able to portray the ups and downs, the ugly and the beautiful, and how strong friendships will always endure distance and time. The characters in Since You've Been Gone were definitely the best parts of the book. Frank Porter was such a dreamy book boyfriend and I couldn't stop picturing Ansel Elgort while reading this book! XD And Collins omg he was the humor that SYBG needed! I loved all the jokes he cracked and the lightness he added to the storyline. Same with Dawn! I really enjoyed Dawn and Emily's friendship, maybe even more than Sloane and Emily's. I was a little disappointed that the rift between Dawn and Emily was never really resolved but I understood completely why Dawn was beyond upset at what Emily did. As much as I wish everyone could be BFFs again, I don't really see Dawn and Emily making up any time soon. Hopefully, it will happen but sadly we won't see it happen in this book. asjhsflkdlgjfgkfg;kf LOOOOOOVED THIS OMG MORGAN MATSON HOW DO YOU DO THIS TO ME. This book was just made of sunshine and butterflies and unicorns. It has been a while since I’ve read something so fluffy and heart-warming. Although this book gave me serious paper towns vibes. pretty much a manic pixie dream girl, every This book was just made of sunshine and butterflies and unicorns. It has been a while since I’ve read something so fluffy and heart-warming. Notice how I start with Sloane instead of Emily (the main character) well, that’s because even if Sloane isn’t present for pretty much the entire book; all Emily can do is think of her. Granted, she is her best friend, but towards the beginning I felt like Emily was the only one who was putting in any effort into their friendship at all, and it made me feel super bad for her. So well, one day Sloane decides to leave without anything but a list for her friend to complete. That made for an interesting plot, but it also made Sloane look incredibly shallow and selfish. Especially since, Emily considered her to be her best friend and he world was pretty much falling apart in the beginning. Throughout the flashbacks that Emily had of their time together all that I could really notice was how critical she was as a friend; calling Emily out whenever she didn’t feel comfortable to do something that Sloane wanted to. Also the fact that she gave her then boyfriend, Sam more importance than her friend was a huge turn off for me personally. Granted, she does end up redeeming herself in the end she was not one of my favourites. Emily as a character honestly felt clichéd at the start of the book. She was literally the archetype of the girl next door, who was shy when talking to guys and going to parties. Who also happened to be nervous while making conversation with people. Her character managed to developed a lot and managed to become a whole new person by the end of the book. I felt like her transformation was really genuine and it was great to follow her as she stepped out of her comfort zones. Also it was great to see her come out of her shell and not be dependent on her best friend and instead become a person that could make her own decisions and choices and relations. I felt soooo proud of her by the end of the book for finally confronting her fears and becoming a better person. Frank as a friend and a character was such an honest and sweet guy. Since the first time that we are introduced to him I found his character to be so authentic and caring. The fact that he played a huge role in Emily finishing her list just makes me so happy. He was such a supportive friend who made sure that he was there with Emily every step of the way and made sure that she wasn’t getting herself into something that she didn’t want. Also he is so funny and geeky he just won me over like *snaps finger* that. Honourable mentions also goes to Collins for being such an adorable comic relief, with his own interesting story arc. Also to Beckett; Emily’s brother for being a hyper ninja. Overall you need to read this book to see how amazing it really is, because despite its flaws it honestly is such a great and heartwarming read. Jsvsjsbaks I read this in a day and although it was super slow to start I LOVED IT SO MUCH, MORGAN MATSON IM COMIN FOR YA!! I met my best friend when I was 11 and almost 20 years, dozens of fights and thousands of miles apart later, she and I are still best friends and I honestly don’t think I would have survived those scary stages of life without her. Why am I suddenly sharing this random information? Because I was very much inspired by the story I have just read about two best friends and how they shaped each other to be the persons they are. I grew up used to the idea that everything could change except my family (which now includes my husband) and my best friend who remain constant in my life. It’s what Emily in the story believed too until one day, she wakes up with her best friend, Sloane, completely vanishing leaving no trace except a list of things to do for Emily, things that Emily wouldn’t dare do but if it meant leading the way back to her best friend, she just probably would. This is my second Morgan Matson read and I could now say she’s becoming a favorite. There’s just something with the way she writes that makes the reader feel good. Even better is how she dozed her plot with mystery and adventure making this a really engaging and fun read and even though there’s this really cute romance going on in the story, the focus is really about the friendship between Emily and Sloane while discovering their individuality in the process. In a well ordered universe everyone will have read this book and loved it just as much as I did!! What a fantastic read this book has been! I have not been so emotionally invested in a book in a while and this one completely swept me up and took me on a super cute and brilliant journey! First thing first, I'm going to talk about the writing because wOW THE WRITING! It made the book, characters, world etc all seem incredibly real and I truly felt like I was there in the story with Emily our main ch In a well ordered universe everyone will have read this book and loved it just as much as I did!! First thing first, I'm going to talk about the writing because wOW THE WRITING! It made the book, characters, world etc all seem incredibly real and I truly felt like I was there in the story with Emily our main character. The writing was just so real and honest, making it pretty hard for you to not be gripped to be honest! The main characters in this book will always have a special place in my heart. I want to be best friends with them. I want to spend my summer with them because I'm sure I'd have the best time! We really get to know these characters, in particular with Emily, and it made the book that bit more enjoyable. I felt like I connected and related to them all, they were all so well developed and felt so real. For many, the ending was anticlimactic and disappointing however I quite liked the ending and felt like it was suitable and believable. Of course I wanted a few chapters more because I really did not want this book to end but when it did end I was left with a warm feeling in my heart. Definitely want to reread this over summer as I think it will be the perfect summer read!! Since You've Been Gone was my most anticipated contemporary YA of this spring - I LOVED Morgan Matson's first novel, Amy & Roger's Epic Detour. I loved it so much that she inspired me to start writing my own novel...which is currently sitting dustily on my computer. ANYWAY. Because Matson has previously written about loss, I wasn't sure what to expect from this book about the loss of a friendship - one that the protagonist, Emily, feels deeply. Emily is a kind of shy, timid teenager when we first meet her - she's a girl who only gets noticed when she's around her wild best friend, Sloane. Because of Sloane, Emily has done a lot of things she never thought she could do - she's gone to parties, she's made out with guys, and she's had the kind of best friend that a lot of us only dream of - one who she can call or text at any moment with a silly idea, and one she can always count on to deliver her "best night ever." But now that Sloane has disappeared for the summer, Emily feels completely bereft. This was a little hard for me to connect with because I've never had a friendship that wound so tightly into my existence. The thing is, Matson writes the book so that you DO believe that Emily would feel this badly about Sloane leaving. The more I got into Emily's character, the more I understood - it's like she's in mourning for Sloane, and she doesn't know who or what to do with herself because so much of her is about Sloane. The only thing she can do is follow a list of crazy tasks that Sloane has left for her (Hug a Jamie. The backless dress - and somewhere to wear it. Kiss a stranger...etc), and hopefully, Sloane will come back and everything will go back to being how it used to be. As a reader, you know where this is going. Everything is not going to be the same, and Emily will have to grow and change because of it. But despite that slightly obvious concept, Matson never lost me as a reader . I never felt like I was reading a single cliche because of how beautifully and cleverly she unfolds the story, through both her words and the plotting. Each chapter in Since You've Been Gone is titled with one of the tasks that Sloane has given Emily, and within each chapter, there's usually a flashback to a time when Emily is hanging out with Sloane. These flashbacks illuminate Sloane and Emily's character and why Emily is being assigned that task. But they also illuminate how much Emily has built Sloane up into a magical, ideal best friend. The more I read about Sloane, the more I thought, "Manic Pixie Dream Girl alert! "- that is, a character who is so charming and the perfect romantic foil who shows up at the precise right moment for no other reason than to push the main character along his/her path. What's interesting with this version of the MPDG conceit is that Sloane is that person for another girl, and their relationship is not romantic. Moreover, the more you find out about Sloane and Emily through flashbacks, the more you realize that Sloane is only an MPDG to Emily - she might not be that in reality. This is one of the masterful, deceptive strokes of this beautiful book - that it is not only a sweet summer romance and a journey of self-discovery - but that it's also a book that deals so realistically with friendship and how we relate to people. I felt like the story was unique because of that friendship - losing oneself in one's friends is something that happens often, but isn't explored much in YA. I'm making this review sound very serious, but Since You've Been Gone is actually a lot of fun - and funny! The list of tasks that Sloane leaves for Emily makes for a lot of daring moments, and that, plus Emily's new friends and acquaintances that she meets during the summer, creates hilarious and meaningful moments that had me squealing in delight. Since You've Been Gone had me from page one. I read in huge, giant chunks with not a lot of time in between because it was SO delightful. I couldn't stop reading or thinking about the book - it felt like Morgan Matson reached in and squeezed my heart after every single chapter. This is one of those books where you almost don't want it to end because you're enjoying it so much - but at the same time, you can't wait for it to end so you can read it all over again. Kick-Arse Secondary Characters: I love EVERYONE in this book. Every single secondary character is a gem, from Emily's parents, the playwrights, to her little daredevil brother Beckett, to Dawn, the pizza delivery girl to Collins, the doofy best friend of Emily's love interest, Frank (more on him in a second). I even love Emily's sort of ex, Gideon, the quiet guy who wants to be more, but was only a convenience to Emily. I'm just listing people at this point, but know this: Matson never takes the easy way out with any of these characters. They all have real personality quirks, and even if they only show up for a few seconds, they are beautifully imagined and surprising every time. Frank is like Colin Hanks in Orange County...sorta? The Love Interest Who Is Not the Typical Hot Boy: FRANK PORTER, be mine! Ok, first of all - how often is the love interest in a book a class president? Frank is a super-focused dude who goes after causes...but he's not the most popular, hot guy, and he's definitely not a guy who's nerdy. Basically, he's just a really good leader who just kind of wants to be a normal guy. His relationship with Emily is so evenly-paced, and so well-developed...this is the opposite of insta-love, guys, and I LOVED it. "But that was my best friend, the kind of girl your eyes went to in a crowd. While she was beautiful - wavy hair, bright blue eyes, perfect skin dotted with freckles - this didn't fully explain it. It was like she knew a secret, a good one, and if you got close enough, maybe she'd tell you, too." "I closed my eyes only to open them once more, and make sure it was all still there - the riot of stars above me, this whole other world existing just out of reach." I had a very interesting relationship with this book. I ended up giving it a 3.5, because while I enjoyed reading it in the end, I definitely had some issues with it. First of all, I started to think the point of the book was Emily realizing Sloane wasn't a very good friend after all. I was really bothered by the fact that Sloane put "Penelope" on the list, when Emily had made it extremely clear to her that she wasn't interested in using a fake ID and going to a bar, and even though she ended up I had a very interesting relationship with this book. I ended up giving it a 3.5, because while I enjoyed reading it in the end, I definitely had some issues with it. First of all, I started to think the point of the book was Emily realizing Sloane wasn't a very good friend after all. I was really bothered by the fact that Sloane put "Penelope" on the list, when Emily had made it extremely clear to her that she wasn't interested in using a fake ID and going to a bar, and even though she ended up having a decent time, it was selfish and thoughtless of Sloane to pressure her to do something she wasn't comfortable with a second time. But in the end, that wasn't the point! In the end they were BFFs for all eternity and none of that was addressed. That felt like a gaping plot hole to me. There's a big difference between encouraging someone to conquer a fear like riding a horse or stealing something petty or skinny dipping, and encouraging your friend to think you need to use a fake ID and sneak into a bar to really live is not really a good friend. That was a message I didn't appreciate from this book. I also was bothered by the fact that the book never resolved any of the issues in the end with Dawn or Collins. Really? We're just supposed to assume that all gets smoothed over? Dawn was REALLY UPSET with Emily. A conversation needed to happen there. This reinforced the thoughts I kept having that this book, while fun, felt a little amateur. But beyond these gripes, I did end up having a fun time reading it. Before things got weird at the end, I really enjoyed the friendships that grew between Emily, Frank, Dawn and Collins. It felt real. THEY felt real. The side plot with Gideon and Sam felt a little extraneous, but I understood the point it served in the story. It was hard to get through the first half of the book, how desperately Emily clung to the idea of Sloane completing her, being her safety crutch, in this incredibly sad and pathetic way, but I did appreciate how much she grew as a person. I loved the conversation she had with Frank about how she shines now. In a well-ordered universe .... this book would not have such a high rating. It's the beginning of summer vacation and Emely's best friend, Sloane, just disappears and doesn’t respond to her calls or messages. She has only left a list of activities that Emely must do. Emely, who understands that when she finish doing everything it will lead to Sloane, start working on it. The main problem is that Emely is extremely shy and does nothing other than the outgoing Sloane. The activities on the list are not exciting at all, but thank goodness Emely befriends Frank, Dawn and Collins, as they make the story more entertaining. The story goes in two times, back with Sloane and in the present with his new friends. Little by little we realize that the perfect and best friend Sloane is neither perfect nor so good friend. The ending turns out to be predictable, hurried and leaves important pending issues with Dawn and Collins. Of course, the message is very good. It should be read by every teenager who live life through another person. En un universo bien ordenado.... este libro no tendría un rating tan alto. Es inicio de las vacaciones de verano y la mejor amiga de Emely, Sloane, simplemente desaparece y no responde sus llamadas o mensajes. Atrás solo ha dejado una lista de actividades que Emely debe hacer. Emely, que entiende que cuando termine de hacer todo Sloane aparecerá mágicamente supongo, comienza a trabajar en ello. El problema principal es que Emely es extremadamente tímida y no hace nada que no sea con la extrovertida Sloane. Las actividades de la lista no son para nada excitante, pero gracias a Dios Emely se hace amiga de Frank, Dawn y Collins, ya que ellos hacen la historia más entretenida. La historia va en dos tiempos, atrás con Sloane y en el presente con sus nuevos amigos. Poco a poco nos vamos dando cuenta que la perfecta y mejor amiga Sloane no es ni perfecta, ni tan buena amiga. El final resulta, además de predecible, apresurado y deja cosas pendientes importantes con Dawn y Collins. A great story that makes me waaaay excited for summer. "Nothing worth doing is easy," Frank said. "Especially not in the beginning. But I'm not about to give up." This story essentially follows best-friends Emily and Sloane who planned to spend the summer vacation together when Sloane suddenly up and left, leaving her with nothing but a to-do list that Emily wouldn't have imagined to do on her own. She then gets an "aha moment" thinking that by completing the tasks on that list might just lead her to wherever Sloane is. Oh, I'm so giddy! I loved it yo "Nothing worth doing is easy," Frank said. "Especially not in the beginning. But I'm not about to give up." Oh, I'm so giddy! I loved it you guys, this was super fun to read. The lists were a nice touch, it was nothing too cliche. The chapters were a bit on the longer side and where most of the time I don't prefer that format, it actually worked well because all of the items that Sloane mentioned has a story of its own. I felt at times that I was able to identify myself with Emily. She's shy, not very outgoing as she finds comfort in being at home and with her family even though she's been to many social outings with Sloane. So, it was really nice seeing her mature throughout this novel regardless of the fact that all it took was marking the items off of that list. I also really enjoyed reading about her new friendship with Frank, Collins, and Dawn. All of them had an impact on her growth, especially Frank *he's the cutest btw, I love him*. ALSO ALSO, Collins was HILARIOUS! FURTHERMORE, There was NO INSTA-LOVE and that actually took me by surprise! The last two chapters of the book was really nice and fulfilling for a contemporary so YAS! If you're looking for a light-hearted contemporary read with lots of adventure, character growth and a bit of romance, I highly recommend this! Got a copy of this book earlier today and the cover is giving me such summer vibes (not like my area of residence isn't summer-ish all year round lol). Anyways, at the moment I'm looking forward to mixing up genres in my currently reading shelf. I normally don't read novels like these, but I'm starting to realize I should more often! They're really cute easy reads. And what's wrong with that? My favorite thing with this novel, without a doubt, is Frank and Emily's relationship. How they were friends first, only to become something more, was enjoyable to watch unfold. Especially with how it seemed they liked one another before either of them knew. I just felt the connection as soon as they met - even if they only took is as friendship. Another important thing to mention, is how well Matson developed Emily's character. At first, she was painfully shy, only to become someone who tried things and stepped out of her comfort zone. It was nice and exiting to see her grow as an individual. I also want to thank Matson for making sure the things Emily did weren't illegal or anything like that. You don't need to break the law to have a good time! Just grab some friends, food, music, and have a good time! Love love loved it!! I identified so much with Emily its kind of eerie. Her story was both fun and inspiring and left me wanting more. Like seriously where is the epilogue!! This book was light and fun read for me, I really enjoyed the budding friendship between Emily, Dawn, Collins and Frank. I also liked how Emily slowly came out of her shell. The List was such an entertaining idea, and the playlists included were a cherry on top (Frank's music taste all the way btw!) Her family, especially Emily's younger brother Beckett, were amazing! Collins was also such a fun character. The reasons as to why I didn't give it 4 stars in the end were 1. I didn't enjoy the last sequence of the book as much and the ending didn't show us what happened with (view spoiler)[Emily and Dawn's friendship, nor Emily and Collins's. Of course I assume she will be friends with Collins because he is Frank's best friend, but Dawn was really upset and I just don't get how a frienship/s that were bult through the book could be left this way when it is what this book was about. We get wrepped up romance ending but not the female frienship I rooted for more, why??? I was undecided about Sloane the whole way through this book honestly. Through a lot of this book, she was this idea for us reader told from Emily's view, sometimes appearing in short flashbacks. I liked that it was a flawed friendship, but nonetheless important and at some point all encompassing to Emily. It was interesting, how given some time apart from Sloane, Emily ultimately grew a voice entirely of her own (view spoiler)[but still was friends with Sloane in the end. Just a bit different friend. (hide spoiler)] I loved that this book showed us just how important and defining friendship can be to a lot of young girls. I also liked that the friendship between Emily and Sloane had its good and bad side, especially as they were such a starkly diffeent characters, sometimes they benefitted from each other, other times they didn't entirely fit. And sometimes I couldn't help but think Sloane wasn't the best of friends, plus a manic pixie dream girl (at the beginning especially), other times I got why she was written this way. But I think the ending convinced me to be more on her side then I may have been before, plus I love that at its heart this book is about their friendship. This book is such a perfect summer read! Even though it's currently raining outside here, this book really made me feel happy and wanting to go on adventures and meet new people! Since You've Been Gone is about Emily, who wakes up one day, discovering that her best friend is gone but she left her a list of things to do. In the process of doing that, Emily makes new friends, falls in love, finds herself and figures out why her best friend left and where she went. This book isn't the most original story out there, in fact it kinda reminds me of Paper Towns (only I liked this ending way better! This book is the one that made me retract 1 star off my previously-5-star Paper Towns rating btw), and it was a little predictable at times, but it was just so well executed and thought out that I'm giving this 5 stars anyway! I loved seeing Emily evolve from an introverted girl to someone who could make choices for herself and dares to speak up. It kind of reminded me of myself a bit and about how I used to be. I secretly dislike Sloane a bit though. During the flashbacks, I didn't like the power that Sloane sometimes had over Emily. Their friendship just didn't seem all that healthy to me. It's definitely good that Emily grew a backbone in the end! The person I dislike the most is Sam though, no worries! The story was a bit slow at times, but as soon as Frank started helping her on the list, things definitely picked up! I love that there wasn't any kind of insta-love here and you really saw their relationship grow. Overall, I really loved this and I advise anyone who hasn't read this yet, to definitely pick this one up asap! I love everything Morgan writes. Amy and Roger's Epic Detour made me smile uncontrollably, and Second Chance Summer made me cry uncontrollably. So, HELL YES, I'M READING THIS. Morgan Matson grew up in New York City and Greenwich, Connecticut. She attended Occidental College in Los Angeles but halfway though a theater degree, she started working in the children's department of Vroman's Bookstore and fell in love with YA literature. Following college graduation (and the proud bearer of an incredibly useful theater/English degree) she moved back East to attend the New Schoo Morgan Matson grew up in New York City and Greenwich, Connecticut. She attended Occidental College in Los Angeles but halfway though a theater degree, she started working in the children's department of Vroman's Bookstore and fell in love with YA literature. Following college graduation (and the proud bearer of an incredibly useful theater/English degree) she moved back East to attend the New School, where she received her M.F.A in Writing for Children. Amy & Roger's Epic Detour, inspired by Morgan's three cross-country road trips, was published in May 2010. It was named an ALA Top Ten Best Book, a PW "Flying Start" book, and was shortlisted for the Waterstone's Book Prize. In the meantime, Morgan moved back to California, went back to school again and in 2011 received an M.F.A. in Screenwriting from the University of Southern California. Her second book, Second Chance Summer, was published in May 2012 and draws largely on her experiences spending summers growing up in the Pocono Mountains of Pennsylvania. Her third book, Since You've Been Gone, was published in 2014.